Emirates has today (1st May 2016) expanded the network of destinations served by its flagship A380 aircraft with the launch of new scheduled A380 services to Taipei and Prague, becoming the first and only airline to operate an A380 into these two cities. The A380 service from Dubai to Taipei landed at 16:50 local time and the second A380 service launch today landed in Prague at 13:25 local time. 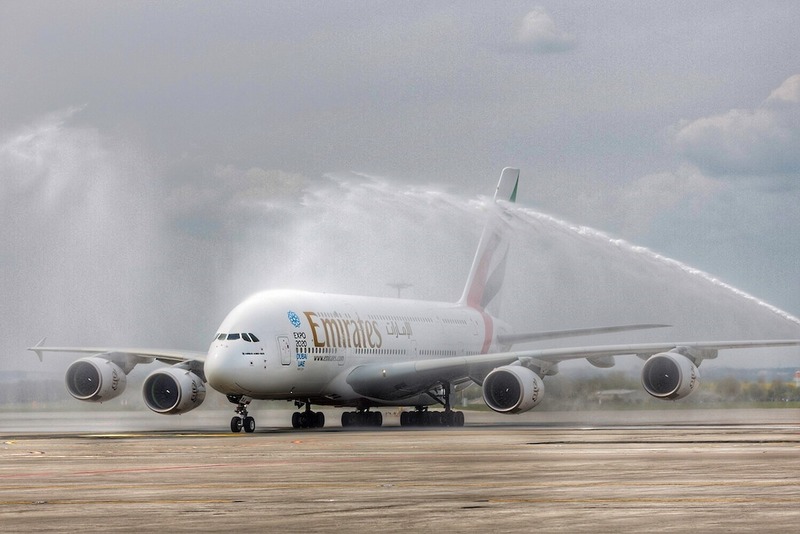 Both aircraft were greeted by traditional water cannon salutes and the VIPs, Emirates executives, media and industry partners on board both flights attended ceremonies in the arrival airports. Taipei was introduced as a daily Boeing 777 service on 10th February 2014 and Emirates has since transported nearly 450,000 passengers between Taipei and Emirates’ Dubai home. The Prague-Dubai route was launched on 1st July 2010 with a daily A330 service and Emirates has since carried over 1.1 million passengers between the two cities. “Taiwan is a significant market for Emirates and we have witnessed a strong and steady growth in demand since our start of services in 2014. We are committed to cultivating the market through continuous investment and we are confident that the launch of our new A380 service will open up further opportunities in business and tourism between Taiwan and other countries,” said Thierry Antinori, Emirates Executive Vice President and Chief Commercial Officer. “We are grateful for the support that our partners, the airports and the local authorities in both Taiwan and Prague have provided to make it possible for us to bring our A380 into these markets. Operating a higher capacity aircraft supports tourism and trade and helps serve the healthy and growing demand from leisure and business travellers on both routes. Emirates is committed to Taiwan and the Czech Republic and we are proud to offer our iconic Emirates A380 experience to our customers travelling to and from Taipei and Prague. We look forward to many more years of cooperation with both cities,” he added. The Emirates Dubai-Prague-Dubai route operates as EK139 and EK140, served by an A380 aircraft that can accommodate 519 passengers in a three-class configuration, with 429 spacious Economy Class seats on the main deck and 76 fully flat-bed mini-pods in Business Class as well as 14 First Class Private Suites on the upper deck.